Introduction: Older adults constitute the largest group of patients on dialysis in most parts of the world. Management of advanced renal disease in the older adult is complex; treatment outcomes and prognosis can be markedly different from younger patients. Clinical teams caring for such patients are often called on to provide information regarding prognosis and outcomes with treatment - particularly, the comparison between having dialysis treatment versus not having dialysis. These discussions can be difficult for clinicians because they have to contend with incomplete or nascent data regarding prognosis and outcomes in this age group. We aim to summarise the currently available information regarding the prognosis and outcomes of advanced renal disease in the older adult by means of a scoping review of the literature. This article discusses our protocol. Methods: This scoping review will be undertaken in accordance with the Joanna Briggs Institute's methodology for scoping reviews. A directed search will look for relevant articles in English (within electronic databases and the grey literature), written between 2000 and 2016, which have studied older patients with advanced renal disease (estimated glomerular filtration rate <�30 mL/min/1.73 m2). After screening by two independent reviewers, selected articles will be analysed using a data charting tool. Reporting will include descriptions, analysis of themes using qualitative software and display of information using charts. 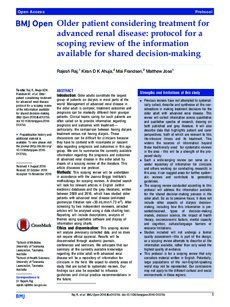 Ethics and dissemination: This scoping review will analyse previously collected data, and so does not require ethical approval. Results will be disseminated through academic journals, conferences and seminars. We anticipate that our summary of the currently available knowledge regarding the older adult with advanced renal disease will be a repository of information for clinicians in the field. We expect to identify areas of study that are suited to systematic reviews. Our findings can also be expected to influence guidelines and clinical practice recommendations in the future.